SL4A brings scripting languages to the Android platform and provides a working alternative to Java development. Free maps, free software. Move freely. Just how far can HTML5 be pushed for writing mobile applications? 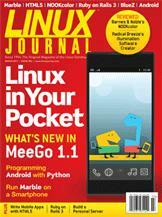 An in-depth look at the current status of the MeeGo Project. Bridging or routing, which is best for your Bluetooth Personal Area Network? You might not have any choice!